A letter from Densmore to the chief of the Bureau of American Ethnology, Smithsonian Institution. Summary of field work, 1907 - 1935. 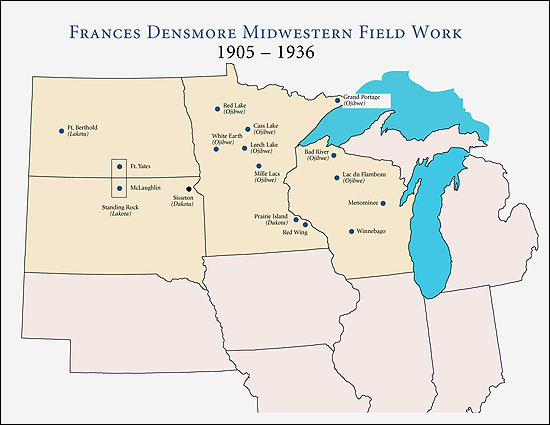 Map of field work in the Upper Midwest. DENSMORE WORKED TIRELESSLY for the BAE. She spent half a century filling up her wax cylinders and notebooks in the summertime, then sorting and interpreting the material back home in Red Wing when the snows arrived. Year after year, her phonograph and typewriter clattered along. Often accompanied by her sister Margaret, Densmore recorded among tribes as dispersed as the Papago in Arizona, the Makah in Washington and the Seminole in Florida. As the years passed, Densmore focused more on gathering music than on surveying an entire tribal culture. The science of anthropology grew more professional; experienced amateurs like Densmore found themselves edged out by men and women with doctoral degrees. Densmore's theoretical approach to the music was heavily influenced by others in the field. Her contribution was more in the way of establishing rigorous research methods and collecting material than in developing new intellectual approaches. In time, Densmore's interpretations grew outmoded. In 1925, Densmore asked for a staff position at the BAE. The chief ethnologist, J.W. Fewkes, said no. He warned the secretary of the Smithsonian Institution that Densmore lacked proper, formal training. Instead, Densmore got the title "Collaborator in the Bureau of American Ethnology." She craved appreciation from the professional men in Washington and coveted her connection with the Smithsonian, America's anthropological hall-of-fame.